Well, it's twenty days into September but today was the first Sunday that really felt like it. 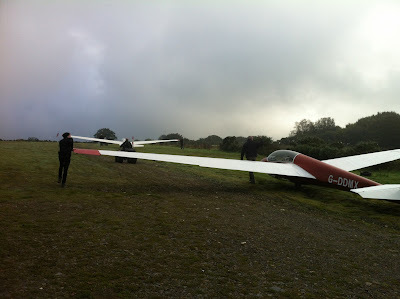 A soft autumnal mist enveloped the airfield and the almost total lack of wind gave that quiet, insulated feeling. 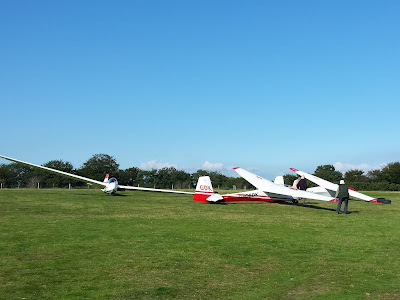 But not around the hangar, where a busy scene provided evidence of good use being made of the delay to get all the gliders DI'ed, hoovered, canopies cleaned and ready to go. Wagon’s Roll! Thirty minutes later and everyone’s off to the launch point. Which, as if by silent magic as the first patch of blue appeared in the sky, was what happened. 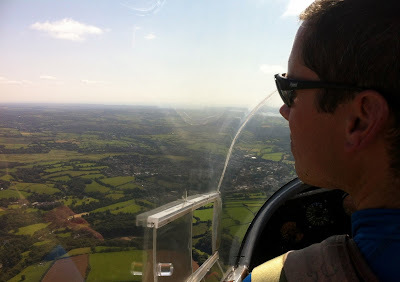 With time to spare before his first Introductory Flight booking, and keen to regain his back-seat currency at Brentor, the Two Rogers, Appleboom and Green, took K-13 HXP to the skies for some experimental filming using Roger A's new headcam (which he uses for motorcycle instructing). Roger-your-Roger: Roger Green pilots whilst Roger Appleboom experiments with his copper coloured headcam. Their fun was soon interrupted, however, by a steady stream of visitors and their families, including Connor and Gillian Crawford (see photos), Kelly Tremblett, Ben Atkinson and Independent Financial Advisor friend of Jerry Wellington, Sarah Joiner (see hair – er her photo)..
Sarah Joiner, a Independent Financial Advisor colleague of Jerry Wellington, flew with Roger Appleboom - and, yes, her hair was that colour BEFORE she arrived at the airfield! Connor Crawford with IFP Roger Appleboom. 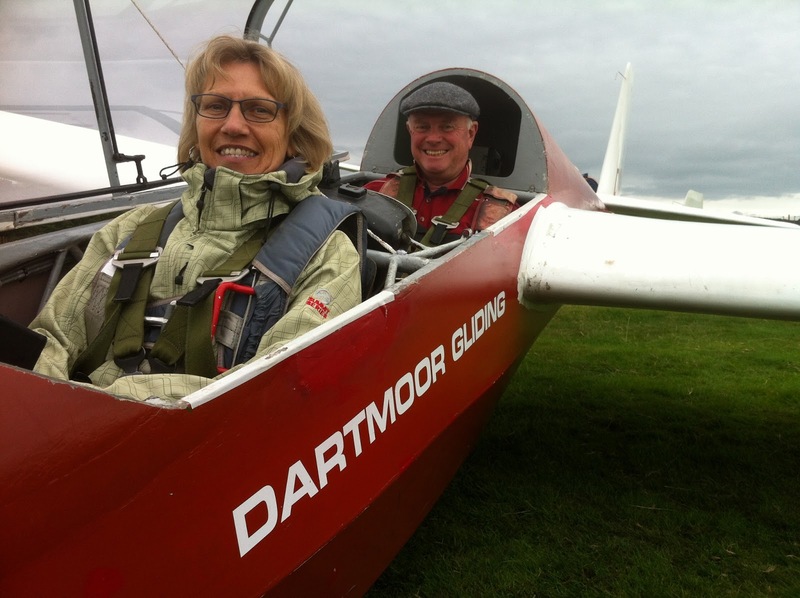 Gillian Crawford also flew with Roger. 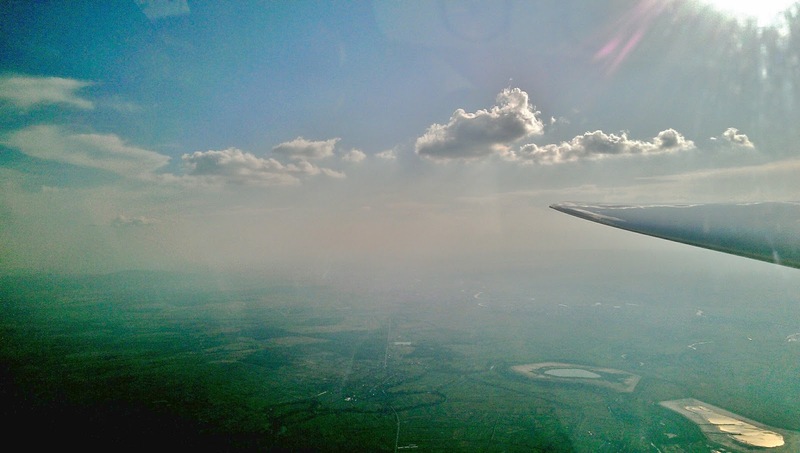 Aloft, conditions could best be described as smooth, with a thin layer of early morning cloud at 1,000ft giving a great sense of vista and perspective. But it wasn't all 'up, round and down' as the K-8 jocks were able to prove, with Jerry managing 11 mins before elevenses, and Peter Howarth 18mins before lunch. Indeed, with a moderate southerly, today was made for the K-8, with its ability to exploit ¼-½-1 up, as 'fresh from the winch' Barry Green demonstrated with alacrity for an award winning flight of 52mins to 2,000ft early in the afternoon. The list of trainees included Paula 'Itchin' for the K-8' Howarth, Karon 'Gettin' my currency back' Matten, Dave 'I'm on telly tonight' Downton, Kit 'Cable breaker (sim)' Smith, new member Steve Fletcher and Theatre Royal marketing manager Ed Borlase. At which point a special vote of thanks must be made to the winch and retrieve crew who, in less than ideal conditions, valiantly recovered two simulated cable breaks from well over the north boundary (and well out of earshot!) Sometimes these things just have to be done at a certain stage in training. 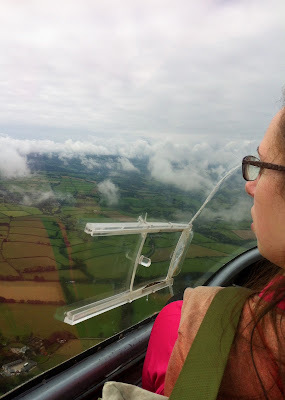 Paula Howarth above the clouds in the aerial playground. 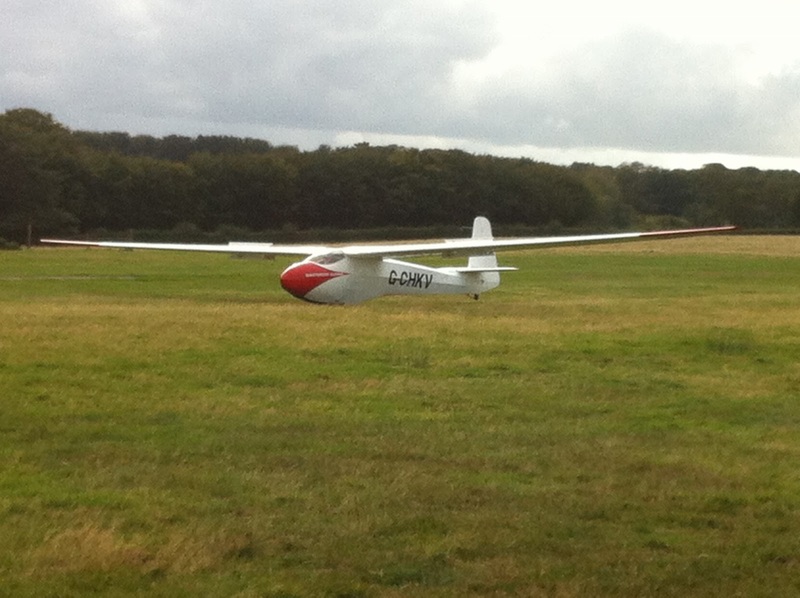 Flying today was in light thermals and a light wind. 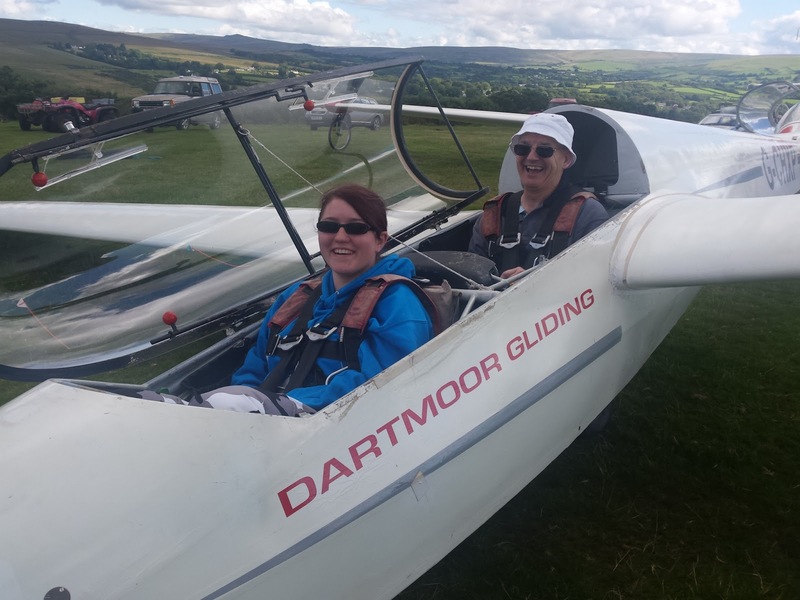 Good flying conditions for our guests William Knapman , Ian Thain , Hannah Vasey and Linda Belton. Apologies to those whose pictures were not captured. They were Simon Dinner and Mark Belton . 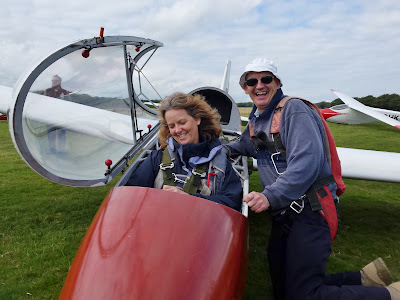 During his flight with Ged , Mark was able in his K13 to join the same thermal as his wife Linda flying in the second K13 to share the flying experience. Big thanks to the winch drivers who enabled everyone to get in the air. Like Captain Jack Sparrow searching for the Black Pearl, we had today, what could be best described as, a skeleton crew. The numbers were probably reduced by the dreadful weather forecast. The tail end of a hurricane was mentioned, with high winds from the north and bands of torrential rain running in from the south east. In the event, we did have the strong gusty north, north east wind but no rain at all. There was enough of us to fly, so it was out with a K13 and on with the show. 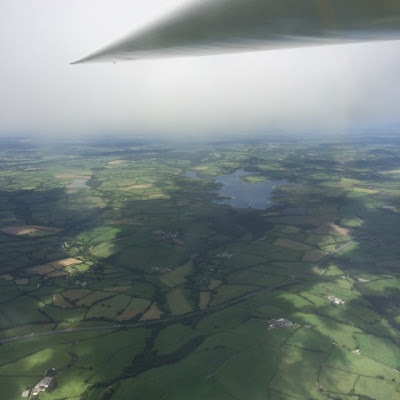 Ged took the opportunity to fly with our trainees, Steve Fletcher and Jorg Beasley who took a couple of flights each to explore flying in these conditions were the approach could best be described as challenging. 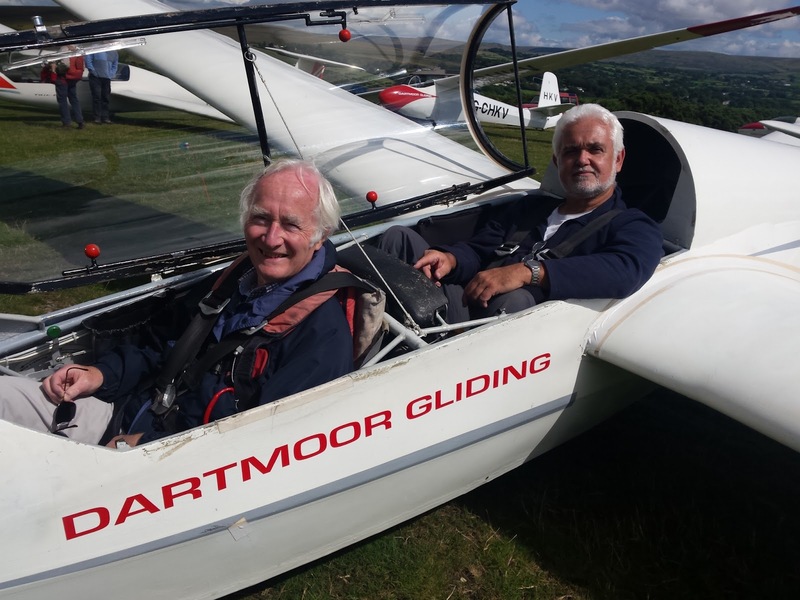 Bob Pirie did some mutual flying with our more experienced members as his swan song. This may be Bob’s last visit to the club as he is moving house soon. Thank you Bob for the many years of Instructing, augmented by some great editorial work with the blog and newspaper articals. 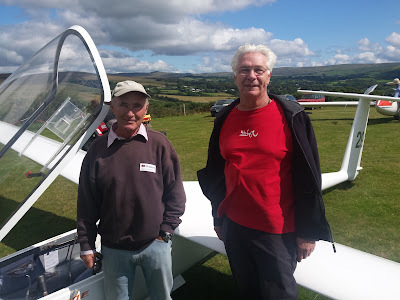 Best flight of the day was by Phil Hardwick, flying with Bob in the K13, who managed to soaring the north ridge for 11 minutes returning for a landing on the stub runway. A smiling Phil told me that “This was the best the ridge has ever worked for him”. Well done Phil. 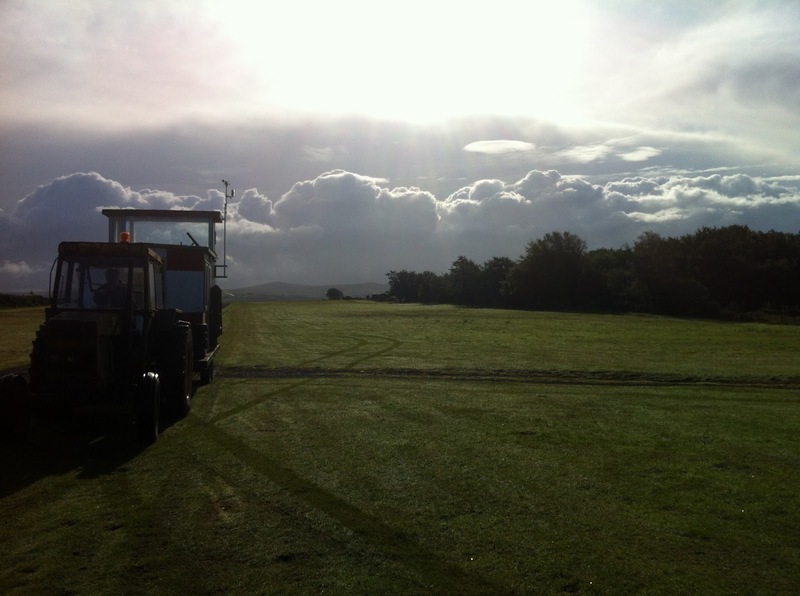 Our thanks today go to Adrian Irwin who drove the winch all day without wanting to fly and to Field Manager Jorg who spent a fair bit of time mowing the south side of the runway after we had returned to the clubhouse for tea and medals. I have recently received some pictures from Stefi Guiu, the Romanian student who has been flying with us over the last 2 years. 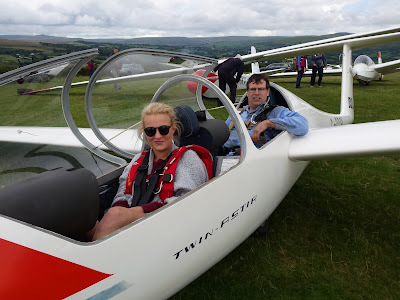 This summer she has a glider of her own, a Grob Speed Astir, named "Speedy" apparently. For the uninitiated, this is a flapped, racing version of the Astir. So, up to mid August she has converted to flaps, flown about 15 hours and now only needs a 50km cross country to complete her Silver "C". We packed up early today. No, this is not an admission of failure on behalf of the Sunday Soarers, merely an acknowledgement that, as Barry Green set the Zugvögel down from his award winning, 49 minute 'flight of the day' (see photo), the clouds to the SE were looking increasingly threatening (Allan Holland was 'hoisting the storm cones' saying we had 30 mins max before the gliders would get wet). And, indeed, it was with a certain smug satisfaction that, as we drove out of the car park, the first spots of rain began to fall. Adrian Irwin moves the launch point to the west end under an ‘interesting’ sky. Those of you who have been in any kind of managerial position will no doubt have had the misfortune to come across the concept of 'LEAN', a reinvention of 'time and motion' that swept through the commercial world 5 years or so ago. 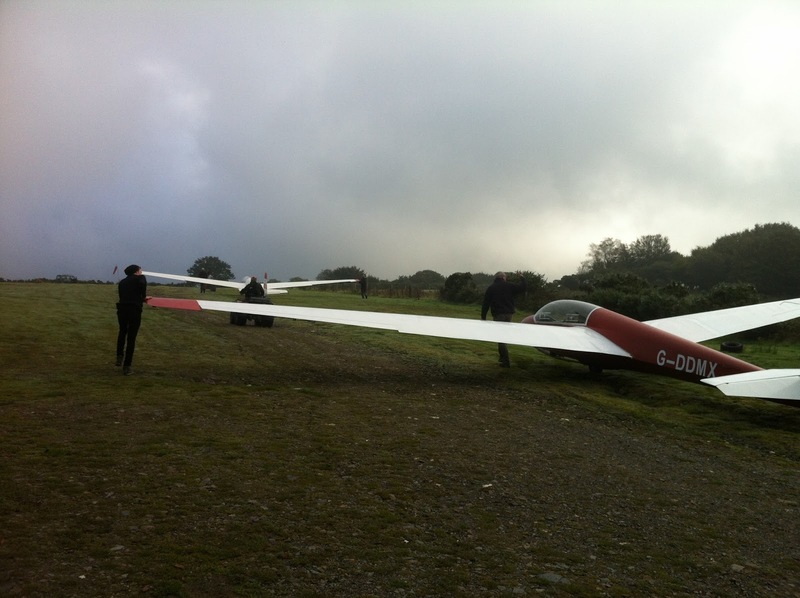 There were even 'LEAN' events... Well, today at Brentor the turnout was so 'LEAN' it was positively anorexic! However, with Adrian Irwin spiritedly towing the launch hut to the west end under an 'interesting' sky (wind from the SE), and Roger Appleboom attending to the cables, there was, thanks to the hand-held radio, no reason why we shouldn't get up and explore the possibility of wave. 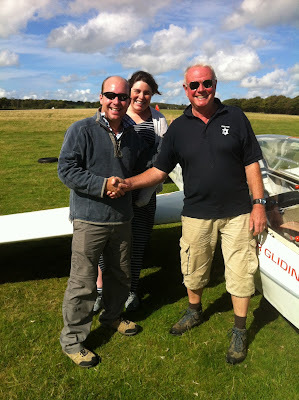 We were visited by fellow glider pilots Andy and Claire Holmes from Lasham. It wasn't long before we were joined by two travellers from the east, namely Andy and Claire Holmes (see photo), who hail from Lasham (and also the Mynd), where Andy flies an LS-8 and Claire 'makes do' with one of the club's Discii..! 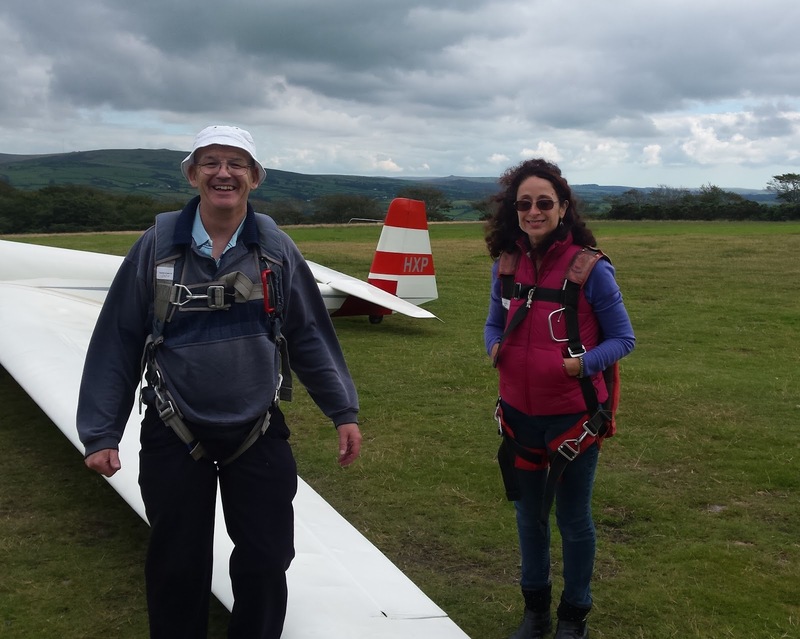 Andy flew with Roger Appleboom for a couple of site acquaints, whilst Claire was quite happy to remain on the ground, since she is expecting twins in five weeks' time. All the best, Claire! As they left we welcomed our Introductory Flight candidate of the day, ex-Serviceman Dave Miles who, in his Army days as a physical trainer in Gibraltar, had actually played football against the England team during their summer training camp. Dave also flew with Roger (see photo). 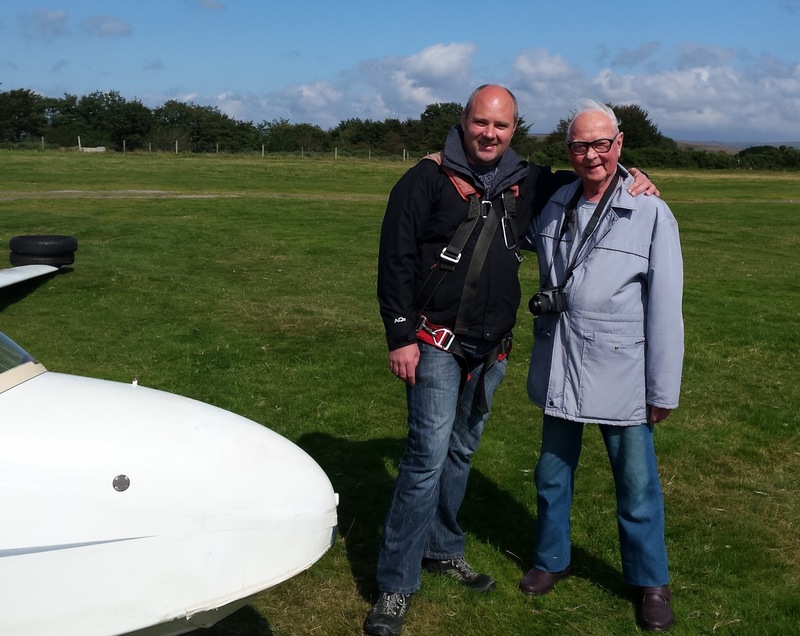 Visiting Service veteran Dave Miles flew with Roger Appleboom. As regular readers know, safety is synonymous with soaring on Sundays, and we were glad to have left the K-8 down at the hangar as the early morning breeze increased to 15-20kts as predicted. 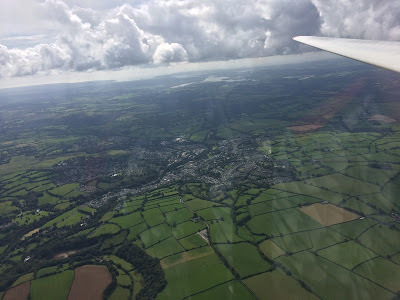 And whilst the wave was not in evidence, the wind strength didn't prevent thermals forming, and indeed assisted in marshalling the cumulus into streets. 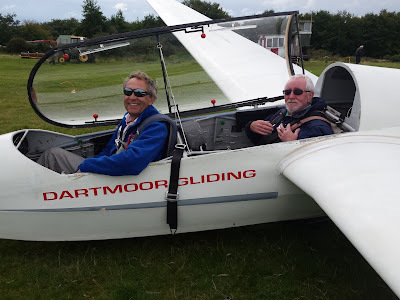 Thus Roger, Adrian and Colin Boyd (flying dual and solo) obtained some useful times exploring various strong, smooth thermals, the best of which seemed to be downwind of the airfield, thus presenting their own 'Should I stay or Should I go?' challenges... Trainee Ed Borlase was also able to experience thermals that enabled him to view the scene from 2,700ft (see photo), whilst getting back into the groove of using all three controls to slip, skid and stall around the sky. Trainee Ed Borlase captured this view of Tavistock from 2,700ft. 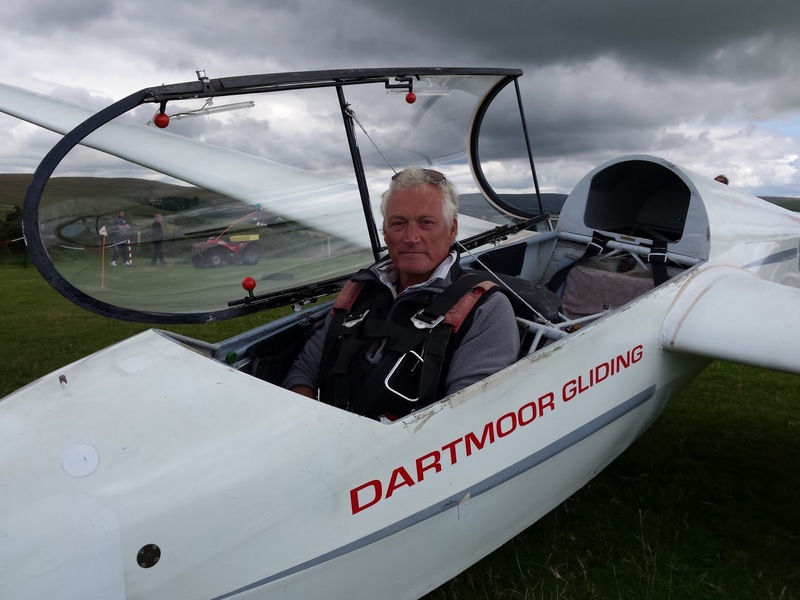 Veteran Winchman Barry Green lands the Zugvogel to claim ‘flight of the day’. With the current low pressure system spinning away to the north of the country and the associated cold front clearing our area during the early hours this looked like a good day in the making. A good day after all that rain with the fields and hills still very wet? Well yes, the effect is a bit like taking the cork from a bottle of champagne. Cork in ( high pressure for the last week is an effective atmospheric cork ) everything in quiet and stable. Cork out ( Low pressure, passing cold front ) bubbles everywhere. Today did not disappoint. 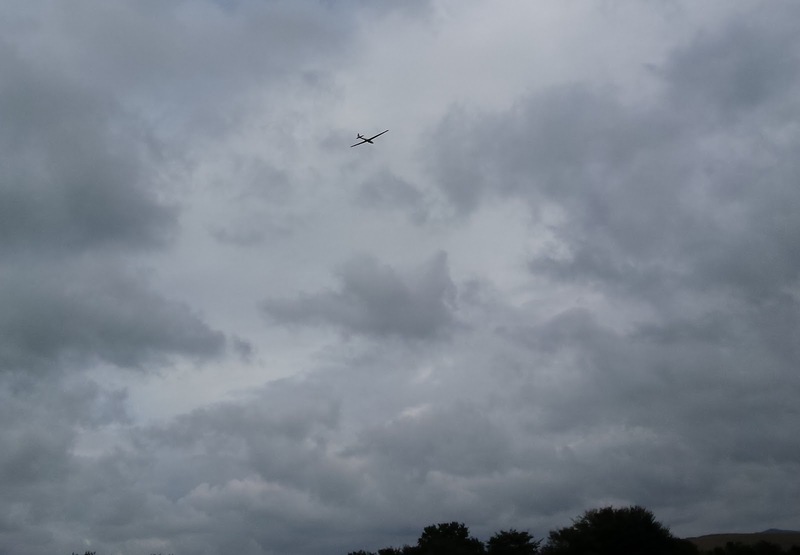 As soon as the rain cleared away, the thermals started. Not gentle 1 knot climbs but strong, very active, thermal cores giving 6 knots+ just about everywhere. Joe Tyler, Ged, me and Joe's grandfather Graham. 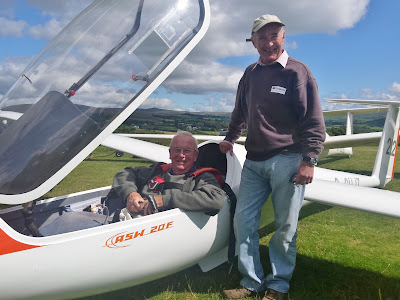 First to take advantage of this was One Day Course candidate Graham Murrell flying with me in K13 G-CHXP who completed the first half of his course with a soaring flight of 3/4 hour. 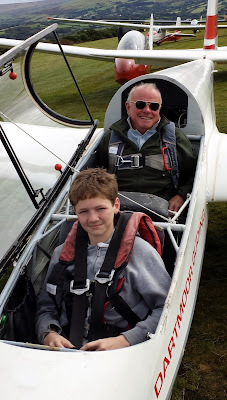 We only landed to allow us to have a cup of tea and for Graham’s grandson, Joe Tyler to begin his own One Day Course with me. Both had a lot of flying and left with smiles on their faces. Richard Robert's view of Roadford Lake. One enterprising club member, Richard Roberts, saw me soaring in HXP and rushed of to rig his K6, launching half an hour later to complete the best flight of the day at 2 hours and 22 minutes. 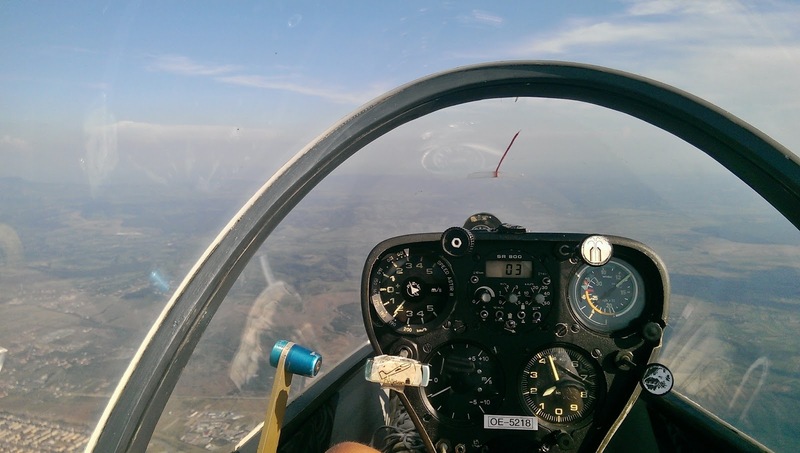 Most members managed soaring flights. 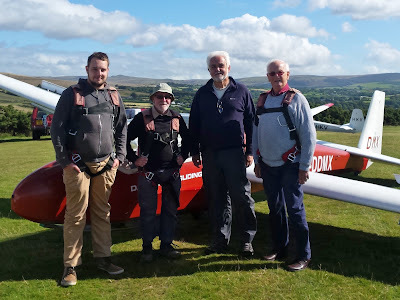 It was nice to see our 3 trainee pilots, Simon Collier, David Downton and Michael Bennett, all have soaring flights of around half an hour with Ged. 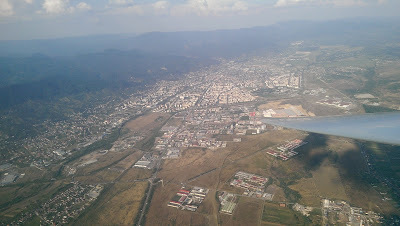 So a good day; only 18 launches but an average flight time in excess of 27 minutes including all the training flights. The current high pressure system has brought a very enjoyable Indian Summer. As the high pressure is to the north this has brought an easterly airflow. Readers of this blog will know that an easterly airflow creates a lot of excitement at the club as members anticipate ( hope for? ) good wave flying conditions. However, to form good wave there are a few other factors that need to be in place. Winds with a lot of east in it. Good. There should be increasing wind speeds with height. Today’s atmospheric soundings indicated that that the airspeeds would be high at flying heights but would be more or less constant with height. Ok I’ve seen some good wave with this wind profile. The killer blow though was the temperature profile. There needs to be an inversion fairly low down indicating the presence of alternating layers of stable and unstable air. There was a weak inversion but it was relatively high ( 4000+ feet ). 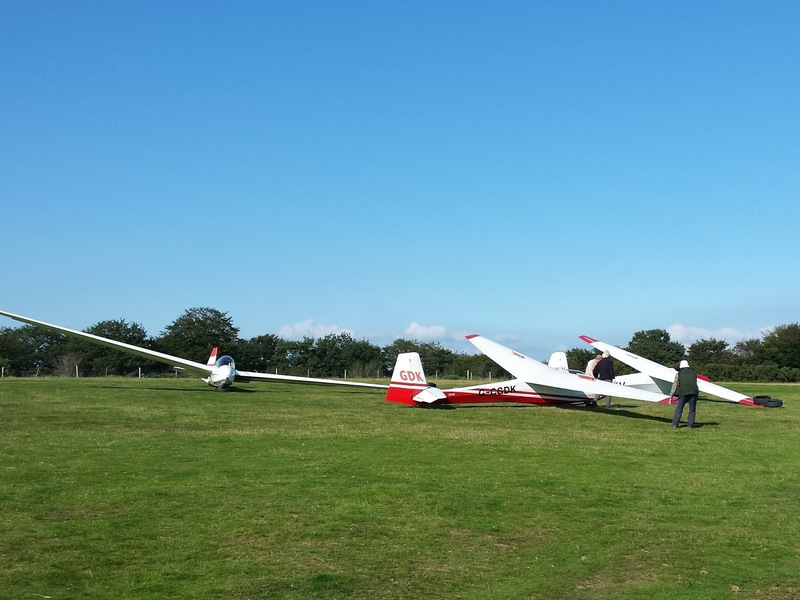 Careful ground handling was required on the brisk easterly wind. 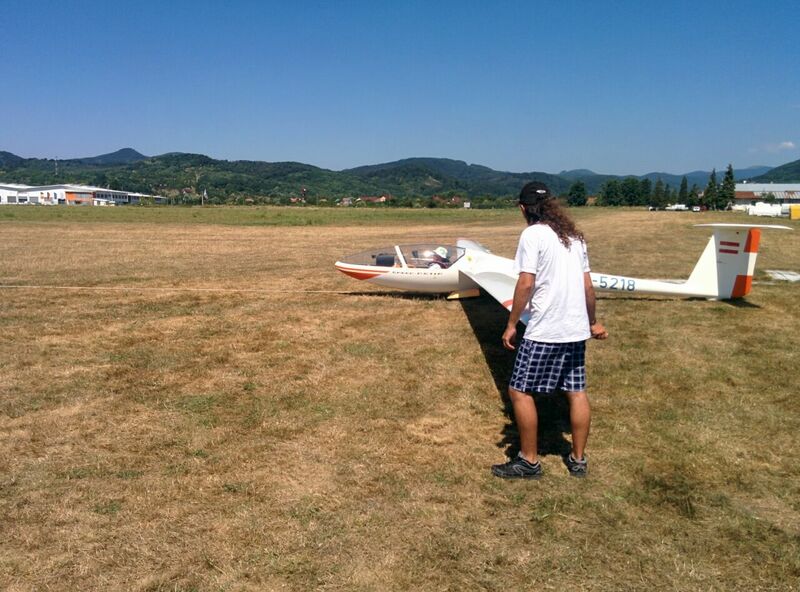 The excitement at the club was enjoyable as members bustled around to get the airfield, and aircraft, ready. ( Who am I to ruin the mood by voicing my doubts? ). 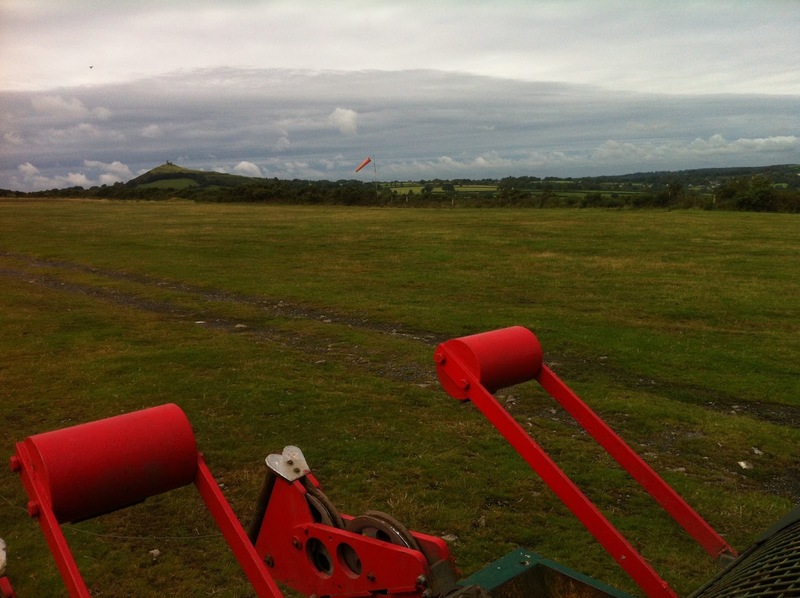 The wind speed at ground level was definitely higher than forecast so the first flights were left to the 2 seater crews to assess conditions which were mostly ok with large areas of smooth air in the 30 knot+ wind at flying heights with some rotor and thermal activity to keep the pilots honest. Conditions were gentle enough to allow us to fly our visitors today so this is what we did. Liz Murphy and Carol Warren for with IFP Fred Marks, Dennis McDonald flew with Ged Nevisky and Anne Pennington and David McDonald flew with me. 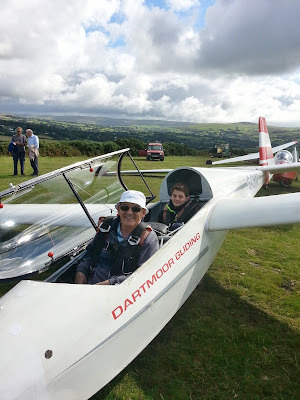 Everyone enjoyed their flights and left the airfield with smiles on their faces. And the soaring? Well there were valiant efforts from all our pilots trying to exploit the bits of thermal. rotor and wave that were all mixed together in the local area. Longest flight of the day was by Adrian Irwin in the Zugvogel who managed to slow his decent from launch height to landing for 37 minutes. The were many soaring flights in the 15 to 20 minute range. Thanks once again must go to Barry Green and Steve Raine for the winch driving and to Heather for her cable retrieve driving. “Far and few, far and few, Are the lands where the cumulus grow; their thermals weak, their cores in the blue, And they went to the sky in a sieve (err, sailplane)” Or so Edward Lear might have put it had his acute bronchitis allowed him (and his “Jumblies”) to visit Brentor today. As the background to the photos here show, there were cumulus, indeed in the morning it looked as if it might over develop, as numerous N-S lines of energy appeared, but by mid-afternoon the cu had become very “far and few”, and it was best to treat the day as blue. The day started like many (used to) in gliding clubs, with Richard Roberts re-discovering the truism that tractors, however ancient, usually start well but only go as far as the diesel in them allows..! Suitably replenished, we got the winch up to the far top left corner of the field to at least give our soloists a decent leg-up (to 1,500ft) in their hunt for thermals. There was a strong team of visitors today, all of whom received excellent value for money from Introductory Flight Pilot Peter Howarth, with an average flight time in excess of 11 minutes . Our first visitors’ photo shows Steve Ellis (left) and Robert Puddicombe; they were followed by partners Ryan Hodge and Lucy Kemp (see second photo), and finally Adam Braim. We were also visited by Rebecca, a Basic Instructor from Cambridge GC. 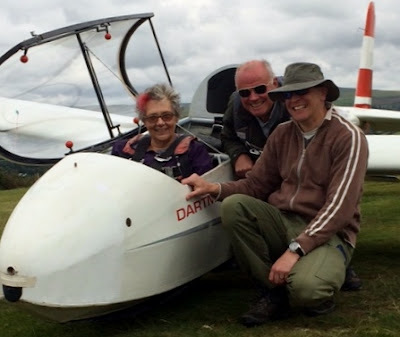 Trainees were also thick (on the ground), including Paula Howarth adding to her P1 launches in the K-13, returning solo pilot Karl Andrews, who eked out 24 minis in the K-13, David Downton and 15 year old new member Amelia Johnson, who ‘commuted’ from Torquay to the club by means of her Dad’s Suzuki V-Strom Adventure bike! Introductory Flight Pilot Peter Howarth flew with Steve Ellis (left) and Roger Puddicombe. Visiting couple Ryan Hodge and Lucy Kemp. Pete’s final visitor of the day was Adam Braim. But the ‘Battle of the Bands’ was surely between the solo pilots for flight of the day. In bronze position (but not where his legs are concerned) was Roger Appleboom who, at 36 mins, was just ‘test flying’ his K-5 following some maintenance. 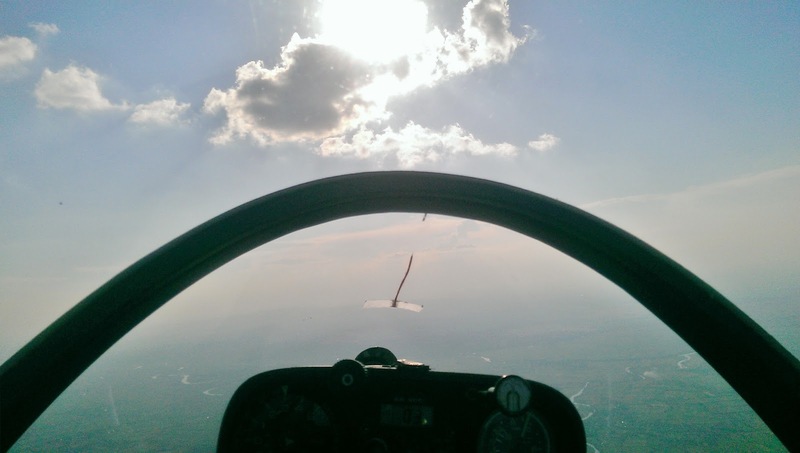 In second place came Allan Holland (1hr 4 mins) who, flying the K-8, concluded that the thermals were difficult to work with very tight cores. 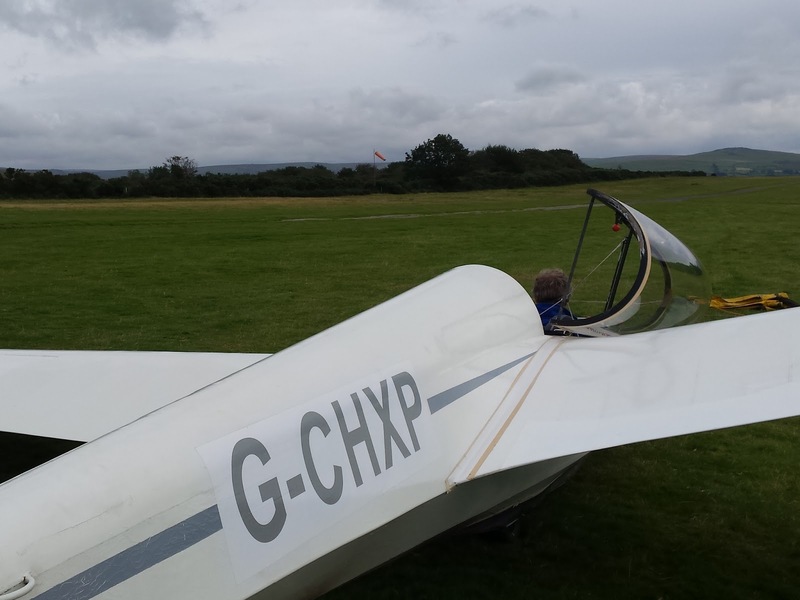 Taking the winner’s laurels then, and deservedly so, was Richard Roberts (K-6) who, launching at a little before 1300, managed to remain aloft for 2hrs 5 mins, during which he obtained a maximum height agl of 2,700ft (cloudbase). He declared the day to be ‘very hard work’ below 1,500ft where, with ½ knot on the vario ‘you just had to sit and wait’ and that 3kts was his best climb. So for these punters it was a day of education and stamina rather than entertainment, with a well earned rest on return to terra firma. Returning solo pilot Karl Andrews at 1,500ft – by the afternoon there weren’t many clouds to choose between..! Thanks go to Heather Horsewill for retrieving the cables all day, to Barry Green for shouldering the majority of the winching, to those who ferried hordes of visitors and their families to and fro, and to Chris Owen and Dave Downton for managing the comms and log. But proudest person on the field? Who should that be? Step forward none other than Leith Whittington who, not content with just flying his pristine Slingsby Dart 17R, also became entitled to the initials ‘WD’ after his name, having been signed off as the club’s newest Winch Driver – well done, Leith! Let’s hope the cu aren’t so ‘far and few’ next week...(it’ll probably rain)! Today there was a full visitor programme with Alasdair Lambie, Amelia Johnson, Liam Beesley, and Caroline Gill flying with IFP Fred Marks. 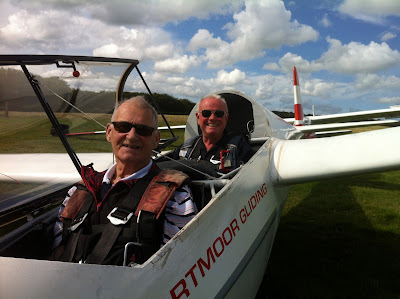 Michael Gascoigne-Pees, Stuart Richardson and Adrian Parsons flew with me. Ged was also kept busy with club training so both of the K13’s were well used today. There were some privateers out today to join the Zugvogel and K8. 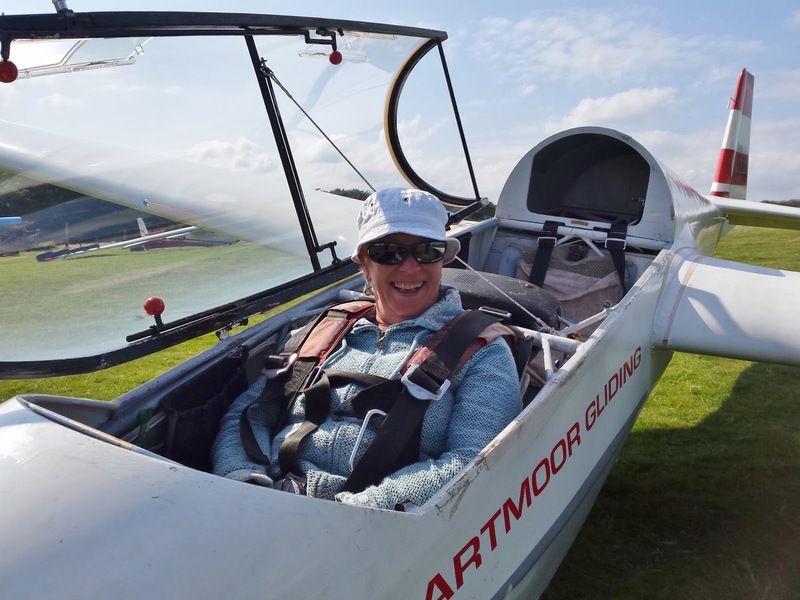 The Twin Astir, Open Cirrus and ASW20 all made good use of the soaring opportunities with the best flight being 1hour 15 minutes by Martin Broadway in the ASW20. The day just lasted and lasted with even the last flight of the day soaring at 6:202 in the evening. Today saw a change of personnel in one of our busy syndicates. Bob Pirie flew the ASW20 for the final time today as his share will now be taken over by Adrian Irwin. 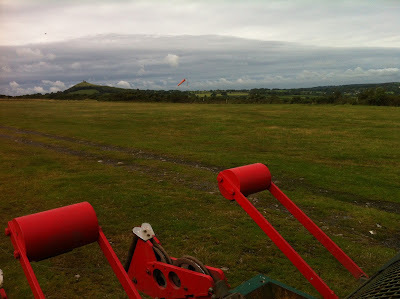 Now many people travel long distances to get to us and so, whilst we put the hurdle fence back up, not long since taken down, I had to conclude that actually, yes, it had stopped raining and that, although the clouds upwind were grey and uninviting they did not actually threaten more rain. So: to remain clear-visioned and resolute with my earlier decision or walk up the gangplank of HMS Vacillation and reverse course? An interesting sky? The cloudscape looking NW from the winch at about 2pm. 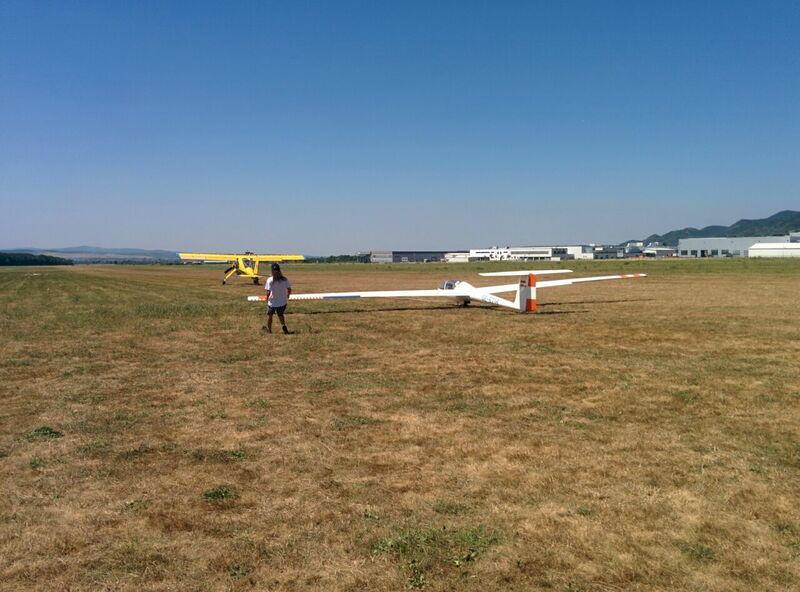 Let’s get flying! Thus whilst we were unable to accommodate our two One Day Courses, we were able to call in Introductory Flight Visitor Helen West, who flew with Roger Appleboom (see photo) and new member Tony Hunston was able to get some hands on in the smooth air and clear horizon that succeeded passage of the warm front, whilst soloists Pete Harvey, Chris Owen, Jerry Wellington and Robin Wilson maintained currency in the K-8. 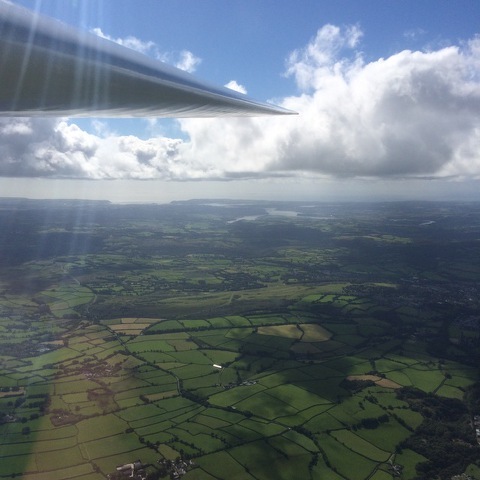 Indeed a small line of slightly darker grey cumulus scudding NE-SW was spotted by Jerry, enabling him to remain in soaring, unpowered flight for a full ‘Flight of the Day’ 36 mins (Roger being second with 17 mins and Robin in bronze position with 9 mins). 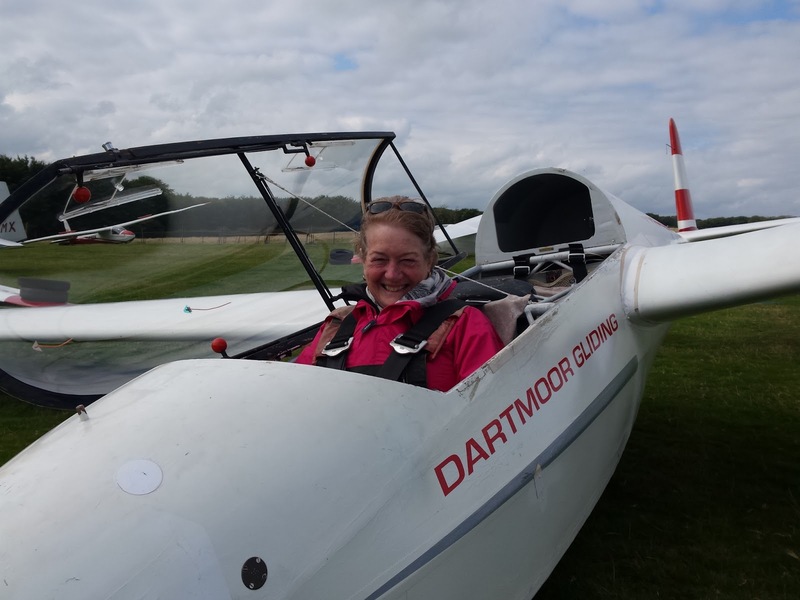 Today’s visitor was Helen West, who flew with Roger Appleboom. At about 6pm, as we were putting the gliders away we reflected that, although nothing great was achieved today, some flying was definitely better than no flying. And sometimes a reversal of decision is better than sticking to the wrong one..! Thanks go to everyone (including Helen) who ‘put up’ with taking the fence down, herding the cows, putting it up again only to take it down (for flying) before finally putting it up again at the end of the day. And, as we drove away from the airfield? The rain started again..!